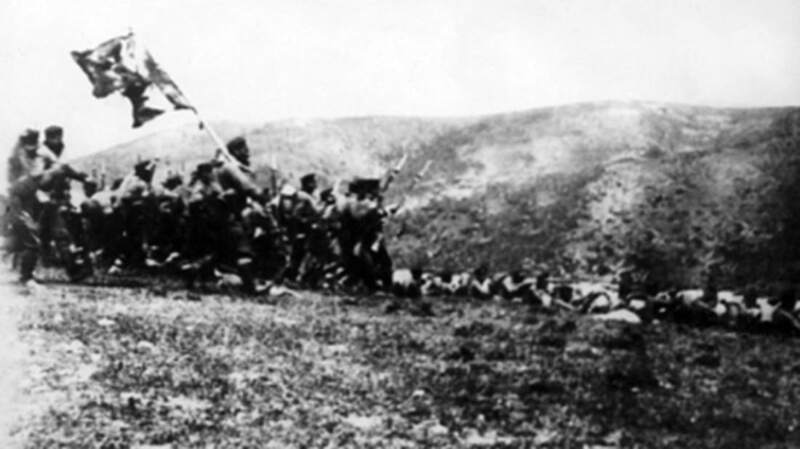 After scoring stunning victories over the Turks at Kirk Kilisse, October 22-24, 1912, and Lule Burgas, October 28-November 3, the Bulgarians pursued the retreating Turks until the latter made their stand about 20 miles west of Constantinople at Chataldzha (Turkish, Çatalca) – where a line of hills cuts the peninsula north-south and the land is made even narrower by two coastal lakes, offering an excellent defensive position. By mid-November, three Turkish armies (I, II, and III) were dug into a network of trenches on the hills, with three reserve armies (1, 2, 3) forming a second line of defense behind them; altogether around 138,000 Turkish troops faced approximately 173,000 enemy troops in the 1st and 3rd Bulgarian armies. The Turkish commanders frantically scraped together artillery from Constantinople and its surroundings, and also drew firepower from a Turkish battleship and cruiser in the Sea of Marmara, while the Bulgarians struggled to bring their own artillery up over muddy Balkan roads. Chataldzha was going to be a last stand for the Turks: if Constantinople fell to the Bulgarians, it would only be a matter of time before Europe’s Great Powers descended to carve up the rest of the Ottoman Empire. Many Turkish soldiers at Chataldzha were now fighting to protect their own homes and families, and while morale was probably low, they were more determined than ever. The approaching Bulgarians, by contrast, were exhausted by hundreds of miles of marching and hard fighting in two major battles, and their ranks were further thinned by an epidemic of cholera, which erupted in the Turkish armies and quickly spread to the Bulgarians. Over-confident after their earlier triumphs, the Bulgarians decided to use the same simple plan of attack that delivered their initial victories – a heavy artillery barrage followed by a mass frontal assault on the Turkish positions by Bulgarian infantry. Beginning at 5 a.m. on Sunday, November 17, Bulgarian artillery shelled Turkish positions while Bulgarian troops advanced towards the Turkish trenches in a heavy fog. However, after progressing several hundred yards the Bulgarian infantry came under punishing Turkish artillery fire and naval bombardment. With Bulgarian artillery mostly failing to inflict significant damage on the enemy, several human wave-style attacks on the Turkish trenches were repulsed, with major Bulgarian casualties from massed Turkish rifle fire and machine guns; one military observer from England described the Bulgarian attacks as “the most futile and wasteful thing, he had ever seen in his life.” During the course of the second night, November 17-18, a Bulgarian assault actually managed to occupy a section of the Turkish forward trenches, but was quickly driven out by a Turkish counterattack before the Bulgarian forward units could receive reinforcements, foreshadowing seesawing trench warfare in the Great War to come. Nonetheless the fighting continued amid heavy rain and fog – the First Balkan War seemed to be one long downpour – through the night of November 17 and into the night of Monday, November 18, when Tsar Ferdinand and Savov finally called off the assault. Total casualties came to around 12,000 killed, missing, and wounded for the Bulgarians, versus around 5,000 killed, wounded, and missing on the Turkish side (both armies also suffered heavily from cholera, which killed around 600 Bulgarian soldiers and 1,000 Turkish soldiers, and incapacitated many more, around the time of the battle). The European Great Powers were all relieved by the Bulgarian defeat at Chataldzha, which meant the Ottoman Empire would survive at least in the near term – thus putting off the day when they would all have to scramble to claim their own portions of the dismembered empire. Even the Russians, while supposedly supporting the Bulgarians, were actually secretly relieved that they failed to capture Constantinople, which the Russians wanted for themselves. Meanwhile a new diplomatic crisis was brewing between Russia and Austria-Hungary over the issue of Serbian access to the sea in the western theatre of war. This was no longer just a hypothetical possibility: on November 17, 1912, Serbian forces reached the Adriatic Sea at Alessio (Albanian: Lezhë), about 50 miles north of Durazzo, meaning the crisis was about to begin in earnest. Austria-Hungary’s foreign minister, Count Berchtold, was determined to prevent Serbia from gaining access to the Adriatic Sea, which would make Serbia less dependent on Austria-Hungary and threaten Austria-Hungary’s access to the Mediterranean; with Serbian troops standing on the shores of the Adriatic, Berchtold had to act now or risk defeat with each passing day. Meanwhile the Russians had to decide how far they were willing to go to back their Serbian clients against Austria-Hungary in the dispute over a port on the Adriatic Sea. Austria-Hungary and Russia were preparing to face off, raising the possibility of a much larger war. See previous installment, next installment, or all entries. This installment should have run yesterday.